No foreign transaction fees on international foreign currency purchases made on the card, including online or outside of Canada. Only the exchange rate applies. Complimentary Priority PassTM membership, giving primary cardholders six free visits per year to exclusive airport lounges from the date of enrolment. Includes access to over 1,200 airport lounges around the world, regardless of what airline you choose or your class of travel. Car rental upgrades and discounts with a complimentary Avis Preferred Plus membership, accessible at Avis locations worldwide. A full range of comprehensive travel insurance benefits including trip cancellation, lost luggage and travel emergency medical insurance. Earn 1.5 Scotia Rewards points on every $1 you spend on all business purchases. Payment control tools: Manage expenses by deciding where, when and how your card is used with account alerts, transaction limits and more. Expense reporting tools: A web-based tool with a range of standardized reports that track spending by merchant, card, transaction, time period and more. All made available from Visa to Visa Infinite small business cardholders. $199 for Primary Card, $0 for secondary card; $50 for each additional card. 19.99% interest rate on Purchases/22.99% interest rate on Cash Advances (including Balance Transfers, Scotia Credit Card Cheques and Cash-Like Transactions). And you may ask what is the sign up bonus for this card? It's 35,000 Scotia Rewards Points when you spend $5,000 or more on the card in the first three months. Also like it's personal card compatriot, there is an annual There is also a spending bonus of 15,000 points when you spend $60,000 or more the card in the first year. So there a couple of differences between this card and the personal card. The earn rate of a flat 1.5 points differs from the 1 to 2 points per dollar spent on the personal card, the sign up bonus is bigger on this card as is the annual spend bonus. Depending on your spending habits, this card could work out better because of the flat rate but you do have to take into account the business card is also $60 more per year for the annual fee. 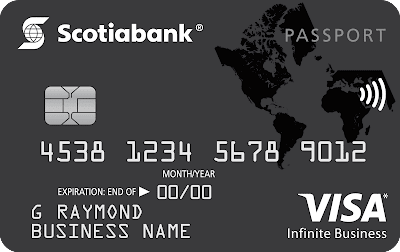 For the business owner this card could be a big boon to your bottom line if you make purchases that are not in Canadian dollars. Saving that 2 to 3% in foreign transaction fees over other business cards is big news. I recall years ago one of our readers telling us how they imported thousands of dollars of items from New Zealand every month ($30,000 if I recall correctly) and they wanted to know the best credit card to have to buy those items. Well if you are that reader and are still importing this is the card to have now if you need a small business card! How about you? What do you think of this new card offering? Let us know in the comments section below! 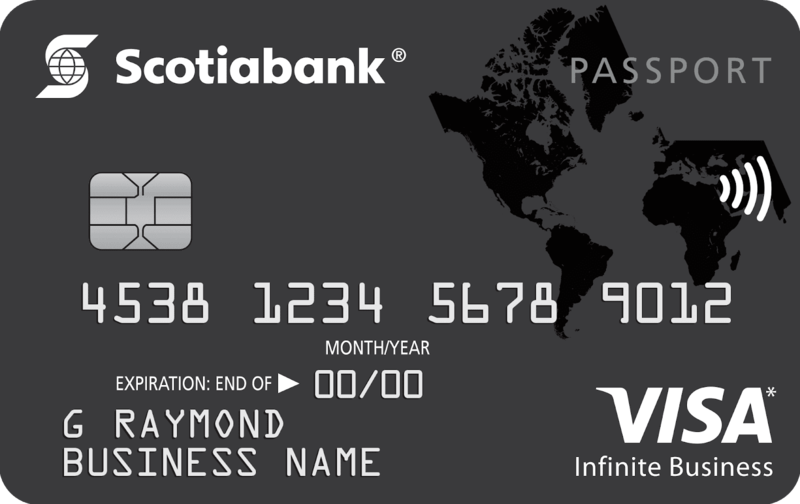 Find out more about the new Scotiabank Visa Infinite Business Card here!